The Chocolate Muffin Tree: Spaghetti Worm Painting!!! 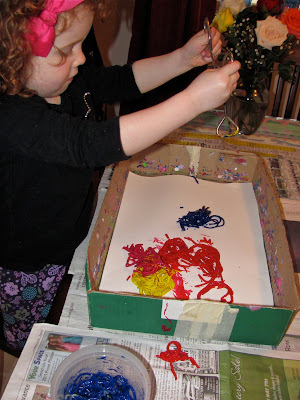 Last week I did a post on Exploring Yucky Worms and ended the post with the idea of painting with real worms! I didn't think it was humane to paint with real worms and I am very surprised people have actually painted with them! This is a continuation of that post. We painted with spaghetti and had Great fun with this process and the pictures prove it! And, No these are not real worms here!!! To begin this endeavor of painting with spaghetti worms, I had to cook up some spaghetti because we had no leftover spaghetti!!! When the spaghetti was cool, I put four colors of tempera paint in containers deep enough for the spaghetti to be covered. 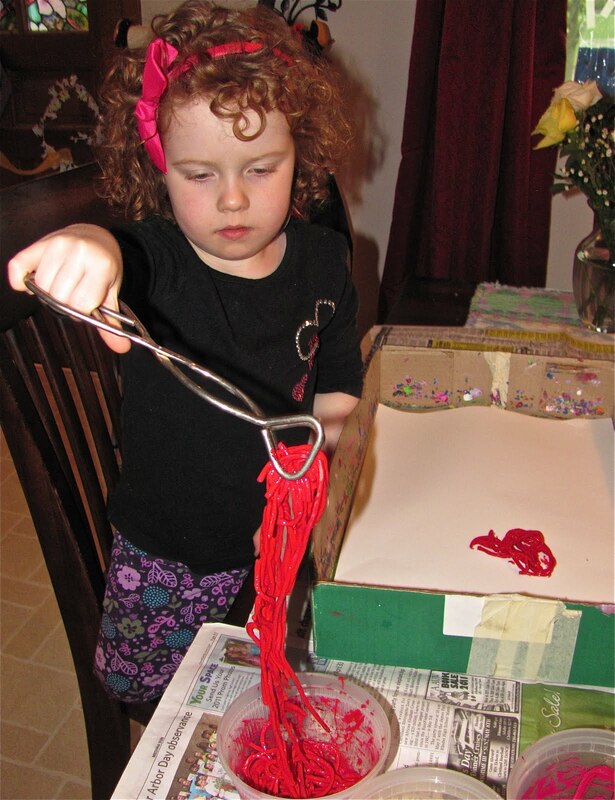 Cassie was quite intrigued with idea of putting spaghetti in paint and wondered if we were going to eat it! Here is Cassie mixing up the spaghetti and paint with a popsicle stick. She thought this was a riot and was laughing at times! Here is our spaghetti covered in paint ready for painting. It looked pretty cool I have to admit! I put paper to fit in a box lid and put tape underneath so it wouldn't move around. You could use a tray or pan too. I gave Cassie some tongs to pick up the spaghetti because she didn't want her hands dirty! 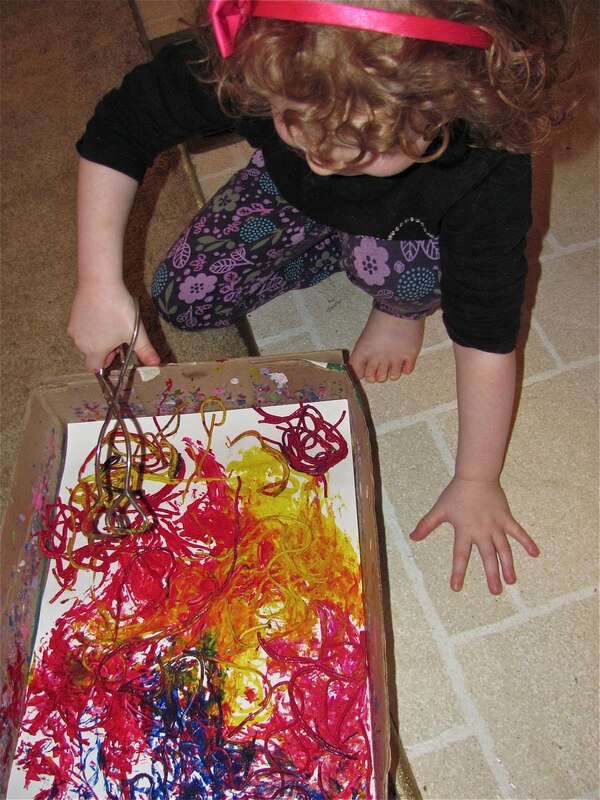 Cassie first put all the colors of spaghetti on the paper and then was ready to shake the box back and forth. Here is Cassie shaking the spaghetti around the paper! At times the spaghetti didn't move around very easily so Cassie was determined and started using her whole body in the process!!! What great exercise for a busy preschooler! Cassie decided to pick up the spaghetti with tongs so it would move around a little better. This seemed to do the trick! Here is Cassie's finished spaghetti worm painting! I decided to try out this project and it was the first time doing this! I enjoyed it too! I think the Artist Jackson Pollock would have enjoyed this process too! 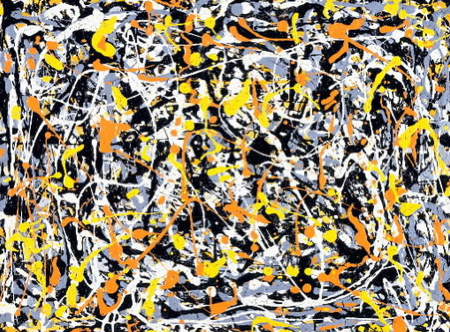 Artist Jackson Pollock mostly did splatter painting by swinging his paint brush around. He also used egg beaters, sticks, poured paint directly out of the can, and I'm sure so much more we don't know! Maybe next we'll try egg beaters, sticks, and pour painting! What items could you paint with besides a brush??? Wow, it looks so artistic! And must had been great fun! worm painting! 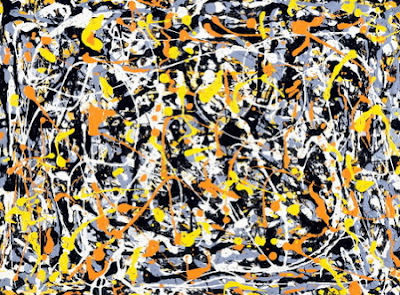 I am so glad you did it and it does look like Pollock. Very cool. I really enjoyed seeing Cassie problem solve her way through this fun sensory/art project. The paintings do look good also - very abstract. And of course she could use so many different colour combinations to create different effects - like your flower suncatchers, with warm tones, or cool tones, etc. This was fun to see! I love-love the end result, and using tongs in the end is brilliant. Now I am thinking of doing it on a small canvas and framing it. Ha! My daughter would have used tongs too! This looks like so much fun, and yes, it does remind me of Pollack's style too. Love it!! Love that it was fun enough for you to make your own! I'm surprised people would use actual worms-don't they breathe through their skin? Did dandelions today. Picked one and brought it in for the kids to look at and talk about. Then used a cotton ball to make the yellow flower part and a marker for the stem! Came out really cute! Wonder how it might have worked if we used the actual dandelion to paint with! They really do look like wriggly worms.... and I love the comparison to Jackson Pollard - always fabulous to show children things from the artists world and get them interest. Perfect! Thank you for visiting Kids Get Crafty again! Oh. My. Goodness. I hadn't thought about spaghetti painting in ages. Who. Flashback. These looks glorious. so vibrant and colorful. I'll have to cook up some soon! i am so delighted to find your blog. it's full of great ideas i can adapt for my two year old. thank you. keep them coming. i'll be checking in! a great project to remember when you've got some left over spaghetti that isn't quite edible! thanks so much for sharing this and all your great projects on Craft Schooling Sunday! Awesome! :) It's totally fun and result is looking great! You are amazing! Another great idea! This looks like it would be great fun, but actually, it is quite difficult. I used it today with my art class of young adults with a diagnosis of autism. Each student had their own pasta mixed with an assortment of colors in paper cups, box, paper, tongs, forks, etc. all set up and ready to go. Their job was to transfer the colored pasta to the paper and shake. Once in the box, the pasta just would not move. We used cooked spaghetti and macaroni. The students ended up tossing the pasta around with their forks, and they ultimately were able to transfer enough color onto their papers. But it was definitely not as rewarding as marble painting and it was quite frustrating for the the students. During the activity,some uncooked pasta was tried, and that moved around a little better, but the activity just did not bring with it the success that the students can find in marble painting. Bottom line: pick another project. I just saw this posted on Pinterest and my 4 year old son and I did it this afternoon! We had lots of fun! We did have trouble getting it to move, but he didn't have a problem getting his hands dirty, so we mostly ended up dragging the spaghetti through the paint. It was so much fun and I wanted to thank you for this great idea! It's so rewarding to make fun memories with my kids! There's a worm at the bottom of the garden and he's painting. This looks like so much fun! I love how process orientated it is and that it has such a wonderful product too! Thanks for linking up over at PreKandK Sharing, I also shared the post on Facebook Today! I really really cannnot understand how can people still use food items for crafts when there is sooo much hunger in this world!!!!!!!!! I can't never use food to play o to craft! This looked like so much fun! I used this as an inspiration for our Wacky Wednesday post! Thanks for the idea!